System leadership in local government — new Collaborate/SOLACE essay collection. 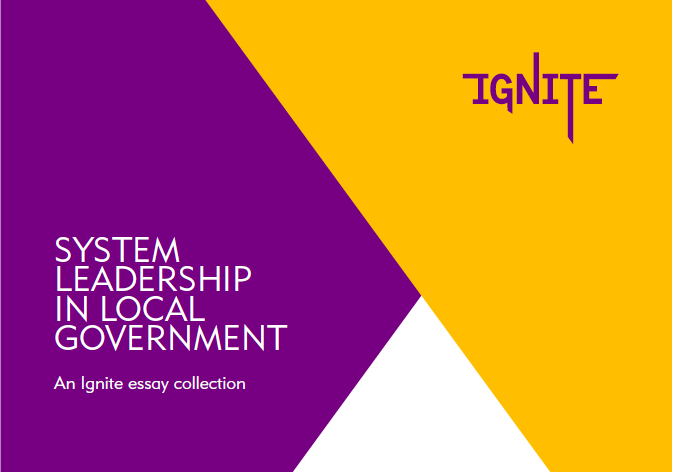 Today we are excited to publish our new essay collection on system leadership in local government, authored by Chief Executives who have participated in the Collaborate/Solace Ignite system leadership programme over the past year. The essays set out compelling portraits of the challenges these leaders face in their localities, in a context of perpetual and rapid change. They reveal how important Ignite has been in supporting their progress, raising their ambition, and reflecting on their work. Local authority Chief Executives were missing critical support and important challenge. And they show how, through Ignite, they found it in each other. The starting point for Ignite discussions has been the context of austerity, rising demand, increasing complexity, and ongoing political uncertainty. These extraordinary factors have certainly formed a now familiar background to our discussions. However, as the essays in this new collection attest, our real focus has been on what it means to embrace this complexity: to develop the personal resilience to work effectively within it and to find ways to bring colleagues, partners and communities along on the journey too. Leaders of public services today face a daunting but exciting task: the reinventing and repurposing of a 20th Century state for 21st Century challenges. This requires new thinking, new behaviours, new relationships, and a fresh mindset about the role of public services and the organisations that deliver them. We are at a point of transition: we know the old models are no longer fit for purpose, yet we still operate largely within them as we nurture the green shoots of the future. Perhaps this is why it feels to me that so much of Ignite, and the essays in this collection, have ultimately come back to the question of purpose. Discussions in Ignite, as the essays reflect, have explored the big strategic issues of today: the future of health and social care; inclusive growth; the purpose of local authorities and public services; relationships with politicians; the changing nature of public engagement and debate. And yet engaging with so much of this really comes back to the ability of leaders to connect with their personal motivation and purpose to improve the lives of people in the communities they serve. As you will see reflected through the essays, participants have approached macro issues very much from a personal point of view: what does this mean for me in my role? Confidence and courage are critical leadership qualities in the face of complexity and uncertainty; personal development and taking the time to reflect, away from the day to day, matters. Participants have observed how difficult it is to find the time, and these essays show that Ignite has created a new and valued space to do so. In our first report about Ignite, authors Dr Henry Kippin and Matthew Taylor wrote that “unless (leaders) are motivated by mission and possibility as well as necessity they are doomed to eternal crisis management… Those occasional moments when it all comes together, when we are reminded of the ambition that first moved us to public service, are a vital source of energy when coping is the least and the most we can do”. Just over a year on, this feels absolutely right. As the essays in this collection attest, leadership itself is personal, and many of the stories reflected are of people finding the inner resources to meet the needs of local people in challenging times. Personal purpose provides the resilience and energy to lead organisations within complex systems. It is the bedrock on which everything else in the role of a Chief Executive rests. Extending our thinking about leadership beyond organisations into systems requires us to start with our own capacity, appetite, and commitment for the challenge. The programme has helped participants to recall why they went into public service in the first place, to consider the degree to which their current roles enable them to fulfil that original purpose, and to reconnect with it, to approach their work today in that original spirit. That is why we are continuing to develop Ignite with new cohorts of Chief Executives in 2018–19 in partnership with SOLACE, and why we will continue to share the learning and insights from the programme. By reconnecting with personal motivation and purpose, combined with the support of sympathetic peers, leadership of local government today seems a place where Chief Executives cannot just cope, but thrive.